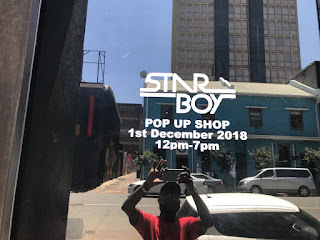 Braamfontein Alive: STAY BOY'S POP UP SHOP. STAY BOY'S POP UP SHOP. Hello Nigerians in my hood (Braamfontein). Come all out tomorrow from (12-7)pm to support STAR BOY's POP UP SHOP at 5, De Beer Street, Braamfontein, JHB. STAR BOY is our brand so let's show HIM LOVE.